We are so totally in love with this bench created by Mr. Anderson of Anderson's Benches. And as you can see from his selection of amazing art you can sit on, it was super hard to choose a favorite. Ben and I both have a fondness for all things shabby and chic but also love conversation pieces which is a category this definitely falls into. 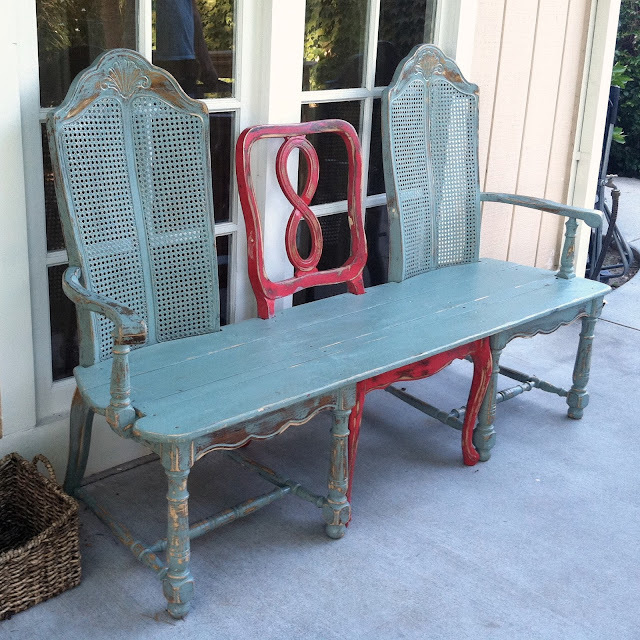 I love the two-toned color and the different chair styles. And at $350, it's totally affordable. So, the next time you're near Hollywood on a Sunday afternoon, stop by and say hello to Mr. Anderson at the Melrose Trading Post. This is amazing, I am loving the aqua-ish color and red! I love it and need that in my new house! oh my goodness, that bench is GORGEOUS! awesome find! this is so beautiful, what a great conversational piece!